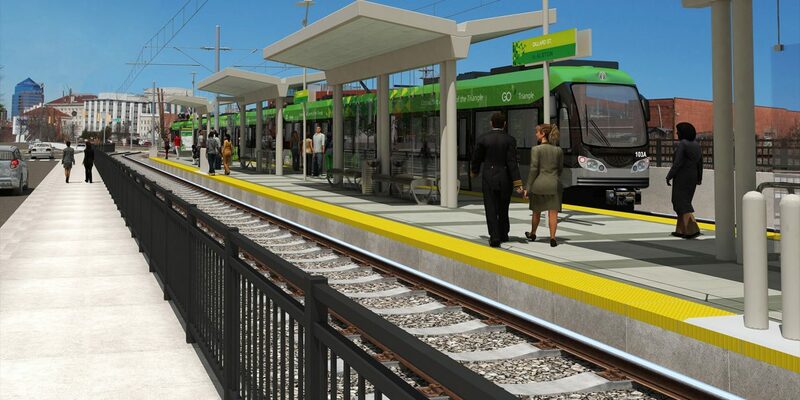 At last week’s Orange County commissioners meeting, officials discussed hiring a third-party consulting firm to review the financial plan for the proposed Durham-Orange Light Rail transit project connecting Chapel Hill and Durham. The vote eventually went 4-2 against the third-party review after prolonged discussion. It just wasn’t the right time, chair of the commissioners Penny Rich told WCHL’s Aaron Keck last week. “We did decide to hold off until March 7 hoping, crossing our fingers, that we’ll have some numbers. And let those numbers run through everyone’s model,” she said. While sorting out the numbers on the state, federal and local level remains a significant hurdle, another key step in the process must be taken in the next week if the light rail is to move forward. When county officials voted to delay possibly hiring a third-party consultant until March 7, they had their eye on a February 28 deadline for Duke University to sign on to a cooperative agreement with the regional transit authority GoTriangle. The transit group has signed agreements with other parties involved, including the Town of Chapel Hill. Without Duke’s agreement, Rich said, the outlook on the light rail project, in its current form at least, is pretty grim. The proposed light rail line is nearly 18 miles long with 19 stops. The capital cost of the project is estimated at $2.47 billion – half of which is expected to come from the federal government. The cost grows to roughly $3.3 billion with financing considered as well. If the cooperative agreement falls through, though, it simply wouldn’t matter what the local funding situation is, the light rail wouldn’t have the land to stand on. The funding model for the project has shifted multiple times in recent years as the Republican-controlled General Assembly has adjusted how much it would devote to light rail projects in general, before ultimately declaring a maximum that could be funded for DOLRT specifically. The General Assembly is currently in its long legislative session where budget talks are expected to be a centerpiece discussion with Democrats winning enough seats last November to break the Republican supermajorities in the House and Senate.